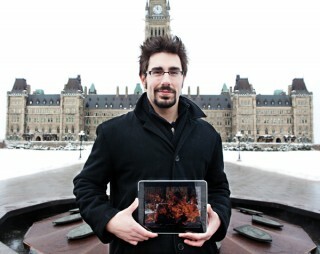 REASON TO LOVE OTTAWA #17: Featuring Nick Charney! Because NICK CHARNEY is shaking things up in the public service. Nick Charney is like a big kid: restless, imaginative, and confident. At 6-1, he is big, and when rubbing elbows with senior policy advisers, the 29-year-old has surely been called a baby. But once Charney, who has a master’s degree in conflict studies, gained permanent status, he took advantage of the security and networked like a madman. After landing a position on a training and development advisory committee, Charney started to see the light — or rather, the darkness and frustration that exist for so many “govies.” He drew inspiration from his father, who, after years of exposure to toxins in the automotive industry, now works as a health and safety inspector. As Facebook and blogs exploded online, Charney started questioning what it all meant for public servants. “It’s one thing to have an LOL Cats blog or a foodie blog, but what about the Facebook group against the prorogation? Is a public servant allowed to join?” Given that they are supposed to be non-partisan, probably not. To make sense of how social media affect the public service, Charney started the blog cpsrenewal.ca. Launched in May 2008 as a way to expand on briefing notes and get people talking about change in the public service, his first post was titled “How a simple wiki could change the way we work.” Less than six months later, the government launched GCpedia, an internal collaborative site that allows anyone with an email address ending in gc.ca to post, comment on, and edit articles posted by their colleagues. He’s not taking credit for the idea (it was traced to a similar project at Natural Resources Canada), but he did take it as confirmation that he’s onto something. “GCpedia flattens government,” Charney says, explaining that GCpedia allows a mail clerk in Vancouver to edit the work of a senior policy adviser in Ottawa, possibly leading to better things for both the policy wonk and the clerk. And though Charney doesn’t feel the site is being used to its full capacity yet, that could change in the near future — part of Charney’s job involves teaching government workers how to build wikis of their own. These online platforms allow for collaborative writing and cut out the lag time of formal approval procedures.